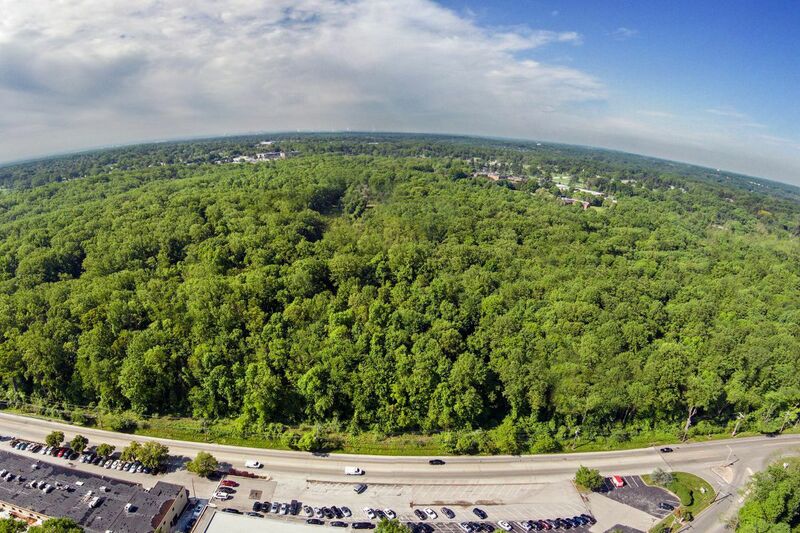 An aerial view of the 213 acres that the Archdiocese of Philadelphia sold to Carlino Commercial Development. In the foreground, the photo shows Reed Road. The Don Guanella Village and school is pictured in the background. More than a year after the Archdiocese of Philadelphia canceled its plans to sell 213 acres in Delaware County to a Jenkintown developer, church officials said this month that they have finally reached a new agreement of sale for the highly coveted land. Carlino Commercial Development, a West Conshohocken-based developer, in partnership with Brian McElwee, president of Valley Forge Investment Corp., has entered into an agreement of sale with the archdiocese to acquire the Marple Township land, representatives from the archdiocese and Carlino said this week. Sources declined to disclose the purchase price. The agreement for the sprawling property — equivalent to the size of 161 football fields — represents a major step forward for the tract, which has been mired in controversy since Jenkintown developer Bruce Goodman purchased it in 2014. Originally, Goodman had planned to build more than 300 townhomes and carriage houses on the site, as well nearly one million square feet of retail and business space. But Marple residents pushed back vehemently, persuading township officials to deny Goodman the zoning changes he needed. With no real possibility of development on the horizon, the archdiocese canceled the deal in July 2016 — leaving the fate of the land hanging in the balance. Now, even with the property under agreement, there is no guarantee that the archdiocese’s latest deal will proceed. Carlino has not released any official development plans for the site, which is still zoned as “institutional” in one portion and “residential” in others, meaning Carlino would likely need a zoning change from the township, and potentially approvals from other agencies, to develop the land. "We are not going to change the zoning for anything that the community is not going to want," said Joe Rufo, president of Marple Township's Board of Commissioners. "… Community input is going to be what's most important for this property." Compared with last year, however, the situation seems to bode better for Carlino than it did for Goodman. In an interview with the Inquirer and Daily News, Peter S. Miller, president of Carlino, said the group plans to designate the bulk of the property as open space. Residents from the Delaware County area hike on the trails and collect trash within the 213 acres. Residents used the trails for years, even as the land was owned by the archdiocese. "Our goal is to preserve and create a long-term public asset for much of the site," Miller said, adding that the development group plans to redevelop the "blighted area" of the land "plus some additional acreage." Most of the blighted land on the 213 acres exists around the old Don Guanella Village and school (located at 1797 Sproul Rd. ), a now-shuttered facility for intellectually disabled adults that the archdiocese once operated on the site. "We think we have identified an innovative business plan with tenants that are largely new to the market," Miller said. "It will be a mixed-use office and retail space, with medical and restaurants." Miller added that a residential component is unlikely. "The most innovative thing that we're doing is really working with the community … to develop a beautiful preservation element," Miller said. Carlino's plans are likely to appease Delaware County residents, who have long supported preservation of the Marple Township site. Many residents liked to hike the property's lengthy trails even when it was owned by the archdiocese. When Goodman's plans emerged after his 2014 purchase, county residents organized and rallied to defeat the Jenkintown developer, arguing that his plans were too expansive and too dense for a county that has seen its population swell in recent years. In a statement issued by Save Marple Greenspace, the preservation group that fought Goodman, members indicated early support for Carlino's plans. "Given the 2015 proposal to clear-cut 175 acres of woods … and to completely build out the entire 213-acre site, any plan that calls for setting aside 173 acres of forest … would represent a tremendous preservation success," Save Marple Greenspace said in a statement. "If this were to become a county park, it would be like no other park in the [county] system," added Ken Hemphill, communications coordinator for the group. Miller declined to reveal how much Carlino paid for the land or comment on how the deal will be structured. No parties involved divulged details about any potential tenants. Carlino's plans have gained initial support from some county officials. John McBlain, a Delaware County councilman, said in an interview that he believed the county would be "supportive of" Carlino's preservation plans. "We have an interest still in preserving the vast majority of the property for open space and parks and recreation," McBlain said. "… And speaking for myself, I would be supportive of the county having some financial contribution to it. Exactly what that will be, I think, remains to be seen." This story has been updated to correct the original developer's agreement-of-sale terms.